HOPE Teams recently supported Camp Noah – a national program developed by Lutheran Social Services of Minnesota to help children by providing a safe place to process their experience and build resiliency for the future. Binghamton, NY (WBNG Binghamton) Dogs, known as man’s best friend, are also known to assist people with a variety of medical conditions. 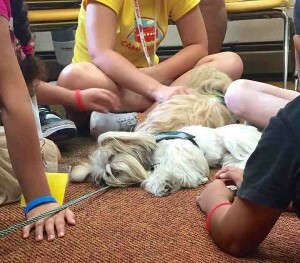 On Friday, dogs from all across the nation gathered at the Binghamton University Downtown Center to learn how to provide a different kind of support. Nearly a dozen dogs and their handlers are earning national certification through HOPE Animal Assisted Crisis Response (AACR) during a three-day course. The course began Friday and runs through Sunday. 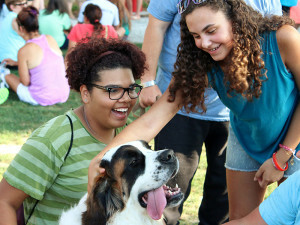 After the course, the animals will be certified disaster relief dogs. Every year HOPE Animal Assisted Crisis Response holds their annual meeting in a different location. The nonprofit therapy dog organization has five regions, and each year one of them gets to choose the city. This year the decision fell to the Southeast Region. They chose Charleston. 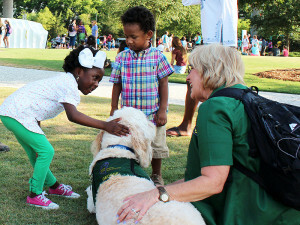 When the news broke that nine people had been gunned down in the basement of the Emanuel AME Church, HOPE handlers Cindy Becker and Julie Scott were able to immediately mobilize their certified therapy dogs, Porsha and George, quickly bringing comfort to a city struck by an unimaginable tragedy. HOPE teams have been with the people of Charleston as they remember the lives of those who were taken too soon and recover to carry on their legacy. Thank you to all the business and individuals who contributed to the HOPE on-line auction!! Comments Off on On-line Auction Success! MARYSVILLE — When Braeden Boyle spotted his new friend the other day, his expression brightened. The lanky freshman bent down and hugged him. They’d spend the next half hour together, walking along the south fence line of Marysville Pilchuck High School where students, staff and volunteers were taking down weathered tributes to classmates shot in the cafeteria Oct. 24. Like a lot of students, the tragedy hit Braeden hard. Bungee, a 3-year-old English Labrador, could sense that and became his companion. 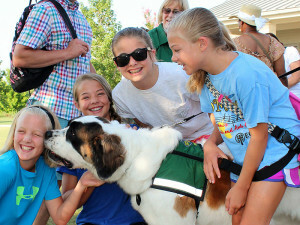 “You watch him change when he is around that dog,” said Gregg Kuehn, the district’s human resources supervisor who watched their reunion Monday. Another 21 dogs trained in crisis response fanned out across the Marysville School District in the days after the shooting. 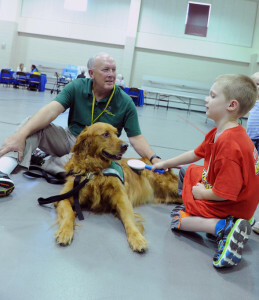 Their job is to help survivors and emergency responders relieve stress. They’re what’s known as comfort dogs. HOPE Welcomes New Members to the Pacific Southwest Region! Welcome Teams and Team Leaders! Comments Off on HOPE Welcomes New Members to the Pacific Southwest Region! Members of Naval District Washington family gathered at the Washington Navy Yard on Monday to honor a group of civilians and sailors for their bravery and service in the midst of last year’s mass shooting that traumatized the Navy. 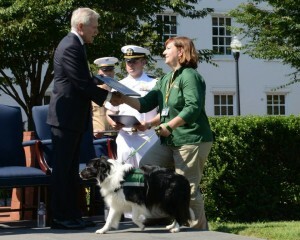 The Secretary of the Navy bestowed the Navy’s Merit for Group Achievement Award upon HOPE Animal-Assisted Crisis Response for the many hours that our volunteers worked to support the recovery. We are very honored to receive this recognition of our service.